Traveler Reviews for Private Tour in Montréal, Quebec, Canada by Tour Guide Nathalie T.
Nathalie was awesome! Her high energy and knowledge of Montreal's history was amazing. She was able to customize our 6 hour tour to fit our desires just after we met. We got everything we had hoped to experience and more!! Nathalie was amazing! We had the best day learning about the history of Montréal and experiencing the best food. Nathalie was entertaining, informative, and very knowledgeable. We highly recommend Nathalie! What a day we had!!! Nathalie is a terrific guide and fun to be with. She showed us the cultural and nature aspects of Montreal, and, oh my, the foodie aspect as well. I think we ate once on the hour with her carefully planned route. My adult granddaughter and I loved our day with her. She is knowledgeable, informative, interesting, energetic and fun. If we were to go back, I'd certainly like to head out with her. Thank you, Nathalie! On a scale of 5 we rate Nathalie an 8! She was warm , engaging, friendly and attentive to our every need. 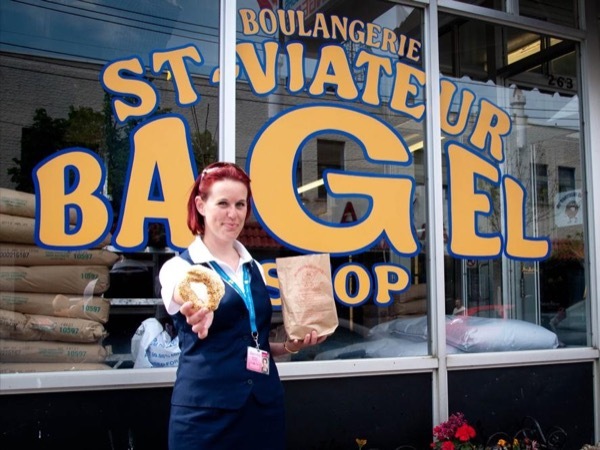 We got to experience Montreal through food and Nathalie's unique perspective as a life long resident. What a great day. We've used several TBLs guides and have always been pleased. Nathalie exceeded our very high expectations! She is a wonderful guide! Nathalie was wonderful! So enthusiastic and personable. She answered all our questions and took us to taste lots of fun foods. We recommend her highly. You will not be disappointed. Thank you again Nathalie for such an enjoyable day! The tour mixed with food in Montreal is really fun with my family including two teenagers. The "Montreal Bites Back!" tour with Nathalie was excellent. Nathalie is friendly, cheerful and fun, and did a great job of showing my family a very large swath of the city while introducing us to a wide variety of the culinary treats the city has to offer. No need to eat anything else all day if you take this tour! I highly recommend this tour. Natalie was fabulous. Very knowledgeable and super friendly. We enjoyed every minute. Laughed a lot and ate so much great food. The whole day flowed nicely. A little bit of walking but very relaxed. Great way to get through the jet lag. Thanks Natalie. Nathalie is a wonderful guide. She is knowledgeable, engaging and , accommodating. Wow! What a great day! Nathalie had the day perfectly planned for us to enjoy the City of Montreal and its vibrant and interesting history and culture and combining that with a tasting tour of some of the best local foods. Nathalie is extremely knowledgeable and enthusiastic and we benefited from both of these factors. Thank you Nathalie for providing a wonderful tour of Montreal. The 4 of us all thoroughly enjoyed the variety of food stops (the bagels were our favorite). Nathalie's passion for the city and her in depth knowledge was impressive. She was thoughtful and flexible. Highly recommend!! Our food/history tour with Nathalie was exceptional and we could not have asked for a better way to see the culture of Montreal. In between stopping for several amazing food samples, Nathalie took us to neighborhoods that truly reflected life in Montreal. We were in awe of the stunning murals and statues all over the city. We ended our day with an incredible picnic lunch that Nathalie gathered for us while we visited the farmers market. We highly recommend touring with Nathalie - she is terrific ! This tour was excellent! Nathalie was informative by giving an insight to Montreal that your average city tour would totally miss: and that's it food. Being a foody I really enjoyed this tour and would highly recommend it to all that visit Montreal. Nathalie knocked it out of the park with her tour! My clients spent two days with Nathalie and says: I want to thank you for putting together such a lovely itinerary for us, and especially for arranging the outstanding tour guide in Montreal. Nathalie helped tremendously with our arrival logistics and was knowledgeable, personable, flexible, and engaging. There are no words in French or English to say how fabulous was the tour that Nathalie gave us. She is amazing - thoroughly well informed about the city and its history; insightful, and personally charming. We have limited mobility, so she created a tour to accommodate our limits and our interests, making things as easy as possible for us, even bringing us food she chose at a local's farmer's market. We came home smiling about our experience. This was well worth the expense. See Montreal with Nathalie! !